Eibhlín Walsh is the Dietitian Manager and Chair of the Nutrition Steering Committee at the hospital. She described the advantages of working with the Patient Experience Advisors and said, “The Nutrition Steering Committee at the hospital is responsible for implementing all nutrition focused projects and improvements. Our committee has benefitted from the insights that Paula Roberts, Patient Experience Advisor has been able to provide. Paula volunteers her time to attend the committee meetings to give the patient and patient’s family perspective. 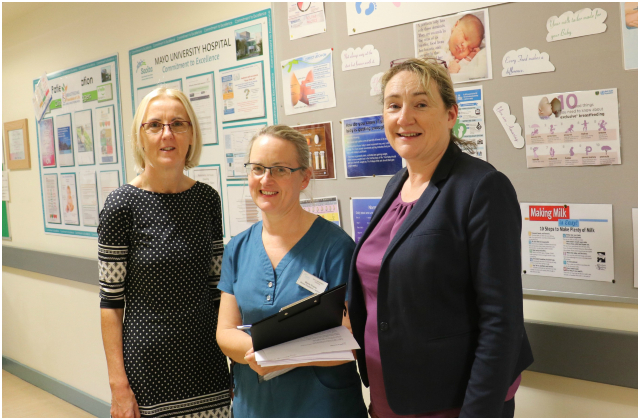 Patient Experience Advisor, Paula Roberts, taking part in a recent nutrition audit in the Maternity Department at Mayo University Hospital – from left: Paula Roberts; Marie Fraser, Senior Paediatric Dietitian; and Loretta Bracken, Catering Manager, Aramark.